It’s so rare that I might start an article with “here’s what Northern Louisiana can teach Southern California … and the world,” that you just have to indulge me for a tiny, delicious moment! In a region, and state, that’s become sadly accustomed to vying with our eastern neighbor on who scores last place on a wide variety of indicators – K-12 education, life expectancy, teen pregnancies, entrepreneurship, and more — it’s so very extraordinary that we get a superlative this awesome. That is: the Shreveport, Louisiana Social Butterfly recently became the most successful butterfly among ALL 200 Social Butterflies around the world! 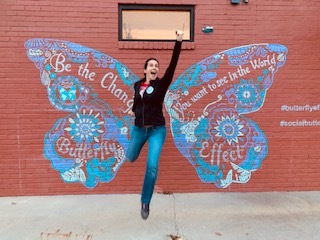 From December 16th, when a friend and I rounded up 23 other women and girls, and organized us into 3 shifts to install and paint our Butterfly to one month later, the Shreveport Social Butterfly attracted nearly 550 participants and raised just over $10,800 for dozens of non-profits, most of them local. The butterfly is painted on a building in the Allendale neighborhood of Shreveport, one of the most disadvantaged in the area, with over 65% of its population living at or below the poverty line. From December 16th to January 16th an average of 20 people a day visited the Butterfly to leap and twirl, perform handstands, hoist their kids and hug their friends. While they posed, they asked themselves what cause lights them up the most and texted their answer to the number listed beside their mural, before sharing their pictures on social media and walking or driving home. What was extraordinary is that in ginning up that much participation and fundraising impact, our Social Butterfly managed to attract a wide variety of community members, drawn by its message that altruism can be joyful, fun and social. Our Butterfly wings’ framed residents from the local neighborhood – as well as every neighborhood around town, school children and grandparents, teens and parents across all racial, gender and socio-economic lines. It even provided backdrop to the Shreveport Police Department, in full uniform, in their efforts to raise money for free after-school arts education program for disadvantaged kids. High-Needs Communities are Hungry for Engagement. I think there is a connection between North Louisiana’s intractable social challenges, such as devastating poverty and generations-old inequality, and why we latched on so eagerly to Tasha Wahl’s brilliant concept of using interactive street art and social media to inspire and empower micro-philanthropy and social change. We’ve been hungry to feel hope that we can make a difference, in our small individual ways, through connection and beauty. As residents of one of the poorest “fly-over states,” we frankly don’t get that many innovative and progressive opportunities, or concepts of great and engaging beauty, offered to us. More importantly, many people living in our community without privilege, resources or a solid array of opportunity don’t often feel empowered and supported to state what they care about and see that statement turn into positive change. One of the reasons the Butterfly Effect model worked so well here is because we truly needed it. A time-limited challenge lights a motivational fire! The Shreveport Social Butterfly came with a 30-day challenge. For each butterfly picture texted between December 16th and January 16th, the Butterfly Effect Foundation would donate $20 to each participant’s favorite charity. Shreveport residents immediately clocked how much impact they could generate for their favorite nonprofit if they encouraged 5, 10 or even 20 people to join them. The time deadline kept us all focused and created a sense of topical urgency that boosted participation and media coverage. Residents spontaneously posted on Facebook, “only one week left to take your Butterfly picture!” and a wave of nearly 100 people came within the final days of our month-long challenge. Empowering partnerships are key. Our Butterfly was painted on the side of a building owned by the Fuller Center for Housing North Louisiana, a nonprofit dedicated helping low-income individuals attain homeownership, which is also the site of a local celebrity chef’s catering business. Both “hosts” were early advocates in supporting and promoting the Butterfly’s success, with the Fuller Center’s live Facebook feed during our painting process, and Chef Hardette Harris’ “Social Butterfly catfish lunch special” that she hosted one Friday to draw community members to the mural. We placed a few strategic calls to the local Community Foundation and several of the larger local nonprofits, to make sure they understood the potential for positive visibility, “mission marketing” and fundraising impact that the Social Butterfly offered. As a result, these organizations aptly spread the word and urged others to do the same. Generating positive media kept visibility high. My organizing co-conspirator, Judy Williams, and I wrote a press release and sent it to local media outlets on the day of our installation. A local news crew came to interview us and ran it on the news that night. The piece was picked up by two local radio stations and our weekly newsmagazine. Two weeks later, a larger local TV station asked me to do a more in-depth interview and publicized the information on how to participate, which was again picked up and pushed out by other area media outlets. At the same time, I interviewed the indomitable and sparkly Tasha Wahl for Amy Poehler’s Smart Girls to tell the bigger story of the Butterfly Effect to a national audience. The net effect of all of this was a solid sense of awareness and support locally that drove consistently strong participation all month. Social media influencers and bloggers added critical fuel. The secret sauce for the Shreveport butterfly, however, was deputizing a handful of local bloggers with sizeable social media platforms and followers to participate and spread the word. These local “cultural ambassadors” kept the interactive and fun, social element of the Butterfly at the fore. They regularly posted pictures of themselves or friends in the wings of the Butterfly, and then tagged dozens of others to share their pictures (and then challenged those people to tag another ten friends). These folks, who regularly post and blog on the best restaurants or festivals in town, know how to capture attention and make a concept go viral. Their excitement and active buy in was a critical part of the Shreveport Social Butterfly’s success. Here in Shreveport, Louisiana, we’re pretty grateful for the Butterfly Effect.